Some of the world’s best investors stick to dividend stocks. They know that a steady stream of income is a top wealth building strategy. And finding the best deals is vital. So today we’re going to review another one of the best dividend stocks around. Let’s take a look at Nike‘s (NYSE: NKE) dividend history and safety. Nike is a $128 billion business. The company is based out of Beaverton, Oregon and it employs 73,100 people. Last year, Nike pulled in $36 billion in sales, which breaks down to $498,000 per employee. The company paid investors $0.245 per share a decade ago. 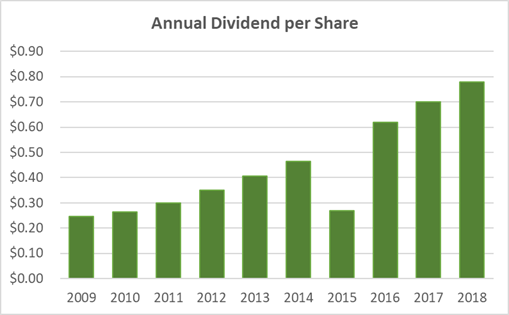 Over the last 10 years, the dividend has climbed to $0.78. That’s a 218% increase! You can see the annual changes below. The compound annual growth is 12.3% over 10 years… but over the last year, the dividend climbed 11.4%. The slowdown in Nike’s dividend growth isn’t a great sign, but it’s still at a high level. Nike might be a good income investment. Let’s take a look at the yield. The Nike dividend yield comes in at 0.99%, which is below the 10-year average of 1.46%. 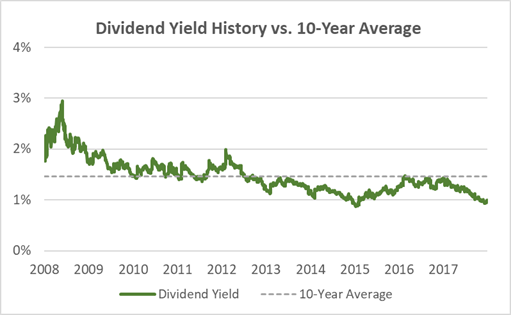 The chart below shows the dividend yield over the last 10 years. The lower yield shows that investors have bid up the company’s market value. They might be expecting higher growth and payouts. But more often than not, the dividend yield is mean-reverting with share price changes. 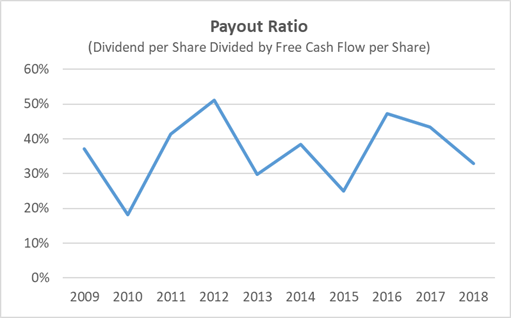 Many investors look at payout ratio to determine dividend safety. To do this, they look at the dividend per share divided by the net income per share. So a payout ratio of 60% would mean that for every $1 Nike earns, it pays investors $0.60. Here’s the Nike payout ratio based on free cash flow over the last 10 years. The ratio is volatile over the last 10 years, and the trend is sideways. The last reported year shows a payout ratio of 32.9%. This gives plenty of wiggle room for Nike’s board of directors to raise the dividend. Nike’s dividend is safe for now, and there’s room to increase it. However, the yield is near historical lows since investors have bid up the price. This is common across many dividend stocks after a 10-year bull market.